"Cartooning itself is a form of communication." 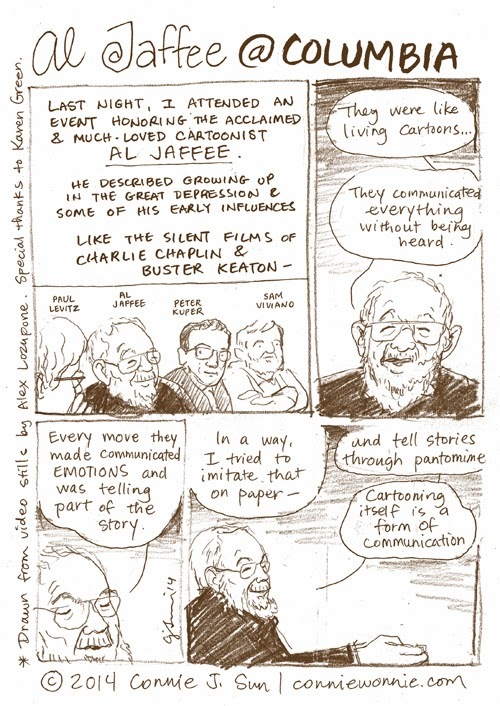 - Al Jaffee speaking at Columbia University yesterday, March 4, 2014. Special thanks to Karen Green for her love of and dedication to comics and to the esteemed guests Peter Kuper and Sam Viviano in conversation with Paul Levitz. Inspiring evening with Comics at Columbia! Oh, how wonderful, Connie--thank you so much! What a terrific takeaway from a terrific evening. Nail on the head, Mr. Jaffee, nail on the head. I am so jealous you could be there in person. That's a great likeness of Jaffee.